Part of all farming is to avoid waste by finding a use for as much of what you raise as possible. It’s the same with raising goats. 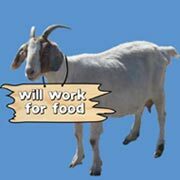 While our main business is noxious weed removal and wildfire protection, we also raise and sell goats for meat. The meat comes from wethers (young male goats). When a doe gives birth, we raise all the kids—boys and girls alike. Most of the girls end up in the grazing herd. But once the boys reach about 80 pounds, we decide if want to keep them to sell as breeders (bucks) or… not. If we don’t think the male goat will create good offspring, we sell them to be slaughtered for meat. Starting in December of each year, our goats are ready to be sold. These goats typically weigh from 50 to 80 pounds. Our goats graze mostly on a variety of vegetation from birth while at mom’s side. In the winter, they graze alfalfa stubble which gives their meat a sweet flavor. We do not do private sales at this time. When it is time to sell, you will see us with a trailer load headed to the livestock sales.